* Patch to add config shortcut. * Fixe a mem leak. is now project wide "Spine Text"
* seems like we are entering a time of heavy development activity??? * koverfile.cc: first attempts to read .k3b files. It should be to hard as these files are also xml based. on first startup. 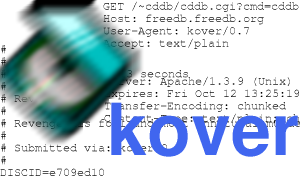 kover will use its builtin values. in Croatia. Yes! Finally! Holiday! Woohoo! the HEAD branch. branches are evil! * kover_file.cc: changed .kover file format to use XML. * without_cd.cc: the without CD cddb query dialog. included for inlet only option. to calculate the cddb-id and prints it to stdout. password is base64 encoded; this is "Basic Proxy-authorization"
information. However not much is left from the original source. * ChangeLog: Do I really like this changelog style? If I do like it, why am I not using it? Last modified: July 03 2007 10:55:16.